I recently switched to Allstate, which I highly recommend. The discount was fantastic and switching could not have been more pain free. There were discounts for everything and my Allstate agent made sure I got every single one. Some agents wont give the discounts to you unless you ask, but this was not the case. 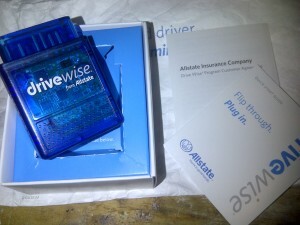 This is just a quick review of the installation process and overall basic information on the Allstate drivewise device. One discount I received was the “Allstate drivewise discount”. It is a small device you plug into your vehicle and it monitors certain conditions. It CAN NOT raise your insurance, it will only give you additional discounts, up to 60 percent! You get an automatic 10% discount just for installing the device, and based on your driving, while it is installed, you possibly can get more of a discount. Here is what they are monitoring. Basically, these are good habits in general, especially if you are trying to save on gas at the pump. Unfortunately, only one of my vehicles qualified for the program, my 1995 Chevy Cheyenne K1500 truck was too old. I don’t have full coverage on either of my vehicles, I just have the bare minimum required by the law, so coverage is not a determining factor either. 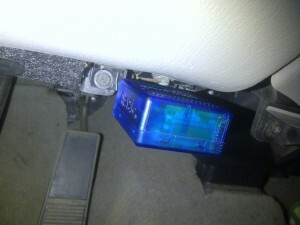 I installed the device on my 1998 Buick Century, it was a fairly uneventful install, to say the least. 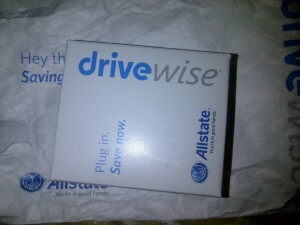 The Allstate drivewise device comes programmed for the vehicle it is going in, and you literally just plug it in. If you run into problems plugging it in, you can call Allstate. But seriously, if you cant plug in this little blue box, please promptly throw your keys in the trash and make the roads safer for the rest of us. This is what is in the box Allstate ships. Be sure to check back for a followup review after I have had the All State drive wise device installed for a while, 30 days for sure. As promised, see my review after 30 days and our projected discount. Numerous screenshots showing the actual data from the drivewise portal.